Changing the properties of an object or file in Content Station can be done for a single object or file or simultaneously for multiple objects or files. Example: You can change the name of a single layout, change the Category of multiple images, change the Workflow Status of multiple Dossiers, and so on. Step 1. Select a file anywhere in Content Station. Step 3. Make any changes and click OK. Step 2. 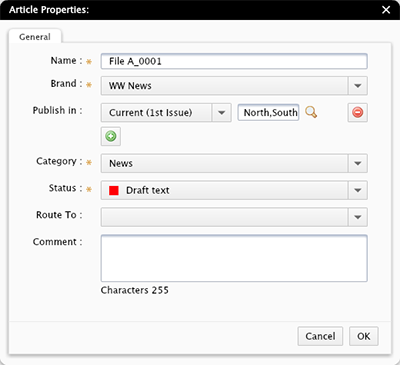 In the Info pane, choose Dossier Properties. The Properties dialog box for the Dossier appears. Step 1. Select multiple objects or files anywhere in Content Station. When all objects or files are of the same type (all are articles, all are images, all are Dossiers and so on), a single Properties dialog box appears with which the properties for all selected objects or files can be changed in one action. When the selected objects or files are of different types (for example: some are articles and some are images), a separate (but single) Properties dialog box appears for each type of object or file. Each dialog box can be used for changing the properties for all objects or files of that particular type. Step 3. Change one or more properties. It is not possible to change the properties for objects or files that belong to different Brands. Example: 2 Files are selected: one that belongs to Brand A and one that belongs to Brand B. Because they belong to different Brands, their properties cannot be changed. A message will appear to inform you of this. Note: These fields therefore do not appear in the Properties dialog box. It is not possible to simultaneously change the properties for multiple objects or files if at least one is fully stored on an external system. In these scenarios, a separate dialog box for all selected objects or files will appear. 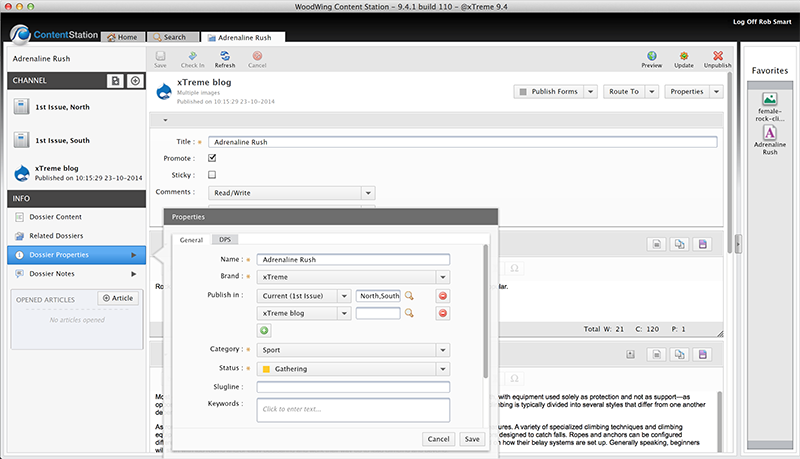 Example: External systems can be Reuters, Twitter, and so on. The object or file is in use by another user or a process that is running in the background. When this is the case, a message will appear inform you about this when clicking OK in the dialog box. You don't have sufficient permissions to change the file. Changes are only made to those files for which you have permission to make that change. Example: 8 Files are selected. For 6 of the files you have permission to change the Status property but for the remaining 2 files you don't have permission to make this change (for instance because the 'Change Status' option in an Access Profile has been disabled). After changing the Status property and clicking OK, the change is made only to the 6 files for which you have permission. The other 2 are left unchanged. You can recognize these scenarios by the warning icon that appears next to the field. The names of the files for which the change cannot be made are shown in the tooltip for the icon (to make the tooltip appear, hover the mouse pointer over the icon). Figure: When changes cannot be made to one or more of the selected files, a Warning icon is shown. The names of the files are displayed in the tooltip of the icon. Access the Properties dialog once more. When doing this for multiple files and the field still displays the text 'Multiple Values', then the change has not been made. Use the columns in the Document pane or the properties pane to check the values for a property. When this happens, the Properties dialog box shows the text '(Multiple Values)' for the affected field. Of course, the value can still be changed and after clicking OK, all files will have that value assigned. Figure: In this example, multiple files have been selected which are assigned to different Categories. 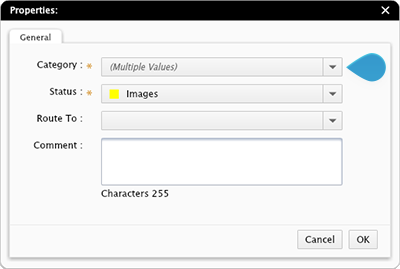 As a result, the Category field in the Properties dialog box shows the text '(Multiple Values)'. After changing a field that has different values across multiple files (such as the Category field in the example above), a Reset button appears to the right of the field with which the original values can be restored when needed. Figure: The Restore button can be used for restoring the multiple values for a field. When a file is routed to a user or a user group, an email can be sent to that user of users of the group. When files are routed by changing the Route To field of the Properties dialog box for multiple fields, be assured that only 1 email is sent containing links to all selected files. Not all properties are suitable to be changed simultaneously for multiple files. Note for system administrators: To make a property appear in the Properties dialog box for multiple selected files, make sure that the property is added to the Properties dialog box and that the option 'Multiple objects' is set for that property. For more information, see Adding a property to the dialog box for multiple selected files in Enterprise 9.